WFU Press’s newest book is here! 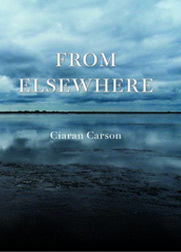 Ciaran Carson’s From Elsewhere is a beautiful work featuring translations of the French poet Jean Follain juxtaposed alongside Carson’s original work. Here, we see Carson’s translation of Follain’s “October Thoughts” alongside “Throwback,” just as they are paired in the book. In “Throwback,” Carson’s response reverberates like a haunting echo of Follain, and creates a space that allows each piece to converse with, answer, and compliment the other.